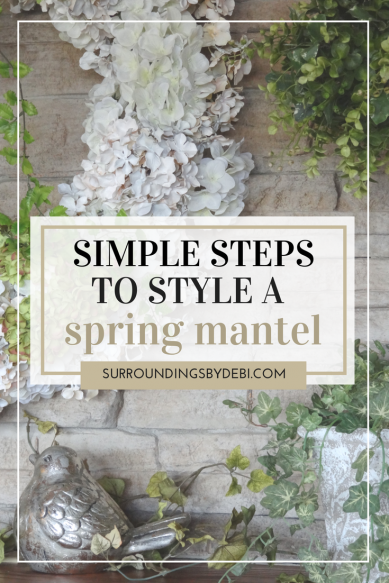 STEP INTO SPRING WITH THESE SIMPLE STEPS TO STYLE A SPRING MANTEL! Aah ~ spring weather is definitely here in Arkansas. Warm temperatures and the sunshine beckon me to get outside and enjoy the beautiful weather. 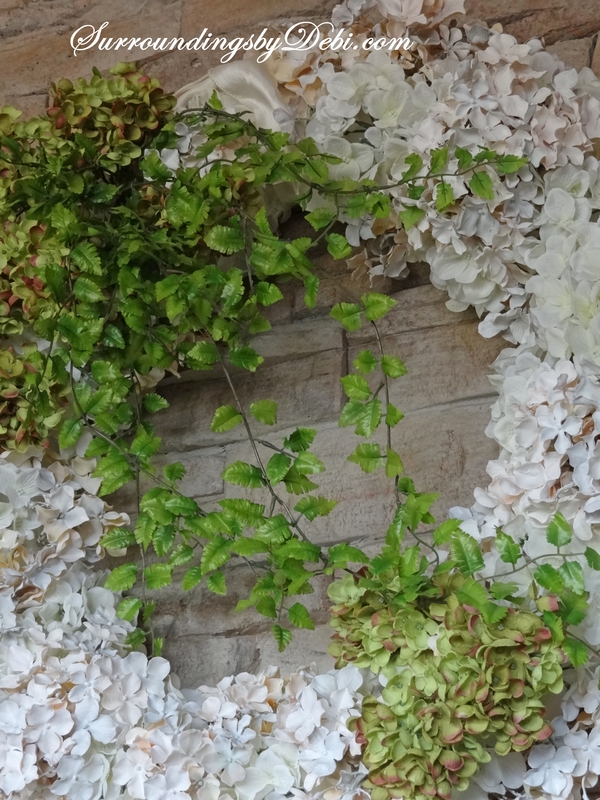 The lovely shades of green, as trees begin to bud and flowers begin to sprout, all represent nature coming alive again. Breathing in the air fills me with a wonderful fresh scent of newness. I am in the mood to decorate my mantel in a wonderful pallet of fresh shades of green and white. 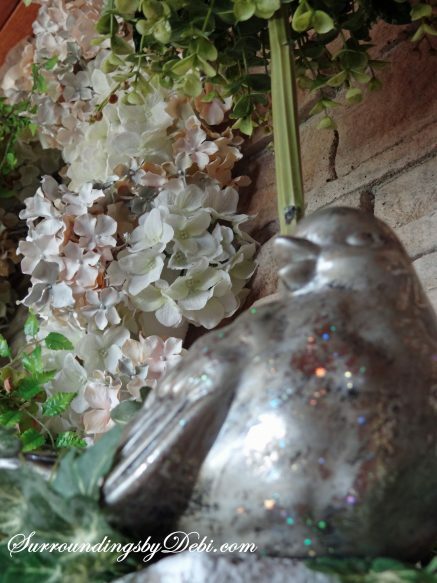 I began by clearing away all of the décor on my mantel, except for the perennial candlesticks. I simply pulled out candles from my big candle “stash”, changed to a soft green color, and centered a white hydrangea wreath above the mantel between the candles. 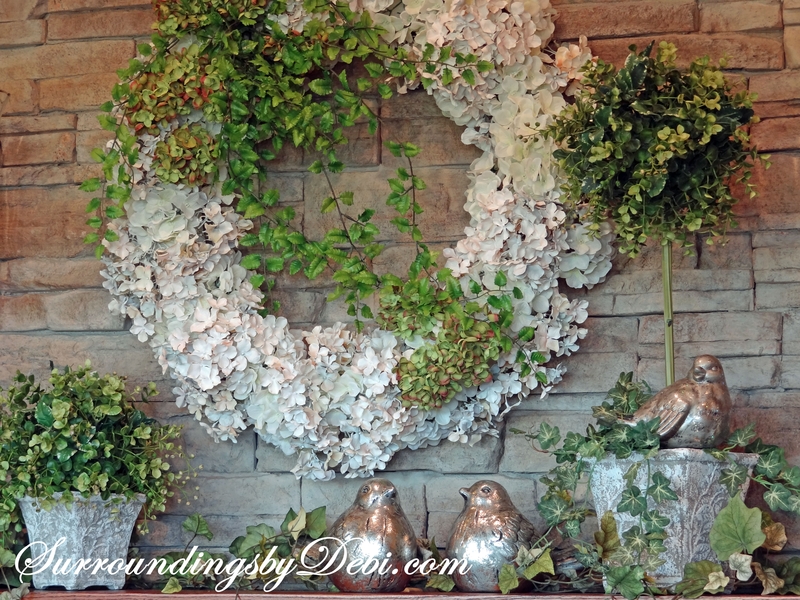 I wanted to bring the green into the wreath, so I added a few green hydrangeas and ivy. In a future post, I will share how to make this simple wreath out of hydrangea blossoms. Once the wreath was hung, I added an ivy bush I bought last season from Hobby Lobby, (if you know me, you know this is one of my favorite hangouts), to the top of the mantel. This particular bush has wonderful soft green coloring and extra-long tendrils that stretched across the mantel perfectly. 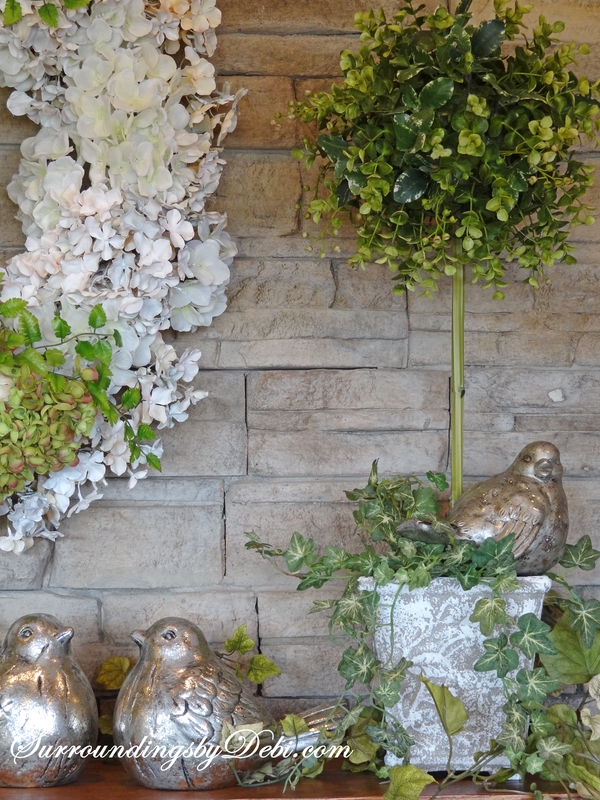 Next, I added a couple of topiaries I had previously created. You can see how to make them yourself HERE. I dropped the base of my topiaries into two ceramic containers that I had recently purchased at one of my favorite shopping hangouts, TJ Maxx . 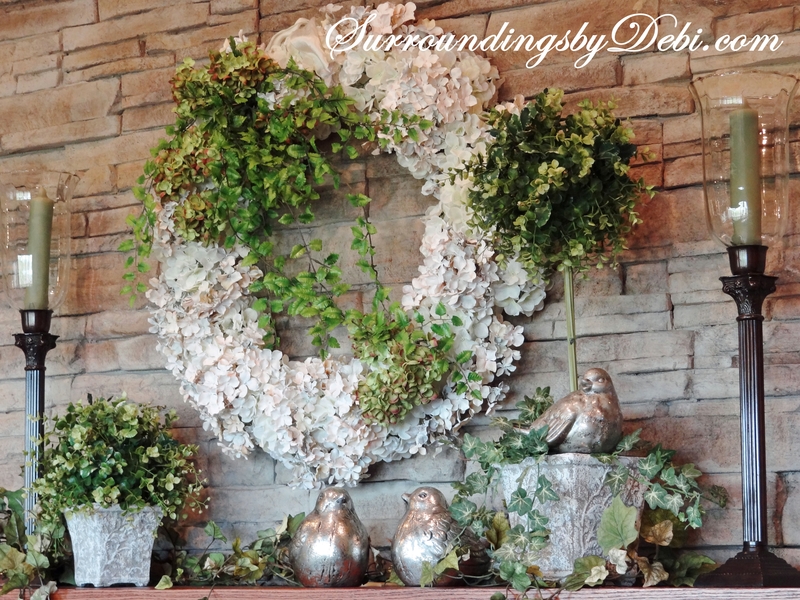 If you read my DIY Topiary post, you will note I usually put my creations into containers that can be changed up when I switch them from room to room. 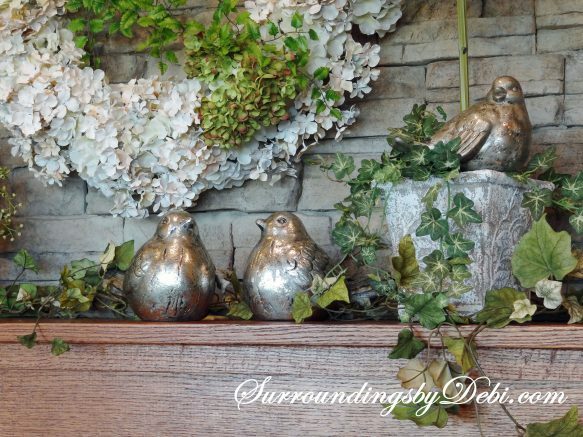 After placing the topiaries on the spring mantel, I added silver toned ceramic birds. I found 2 of them at TJ Maxx and another at one of my favorite shops in the Lake of the Ozarks called “Evergreen”. They have wonderful gifts, and a room packed full of boxes of floral stems, ribbons, and containers. 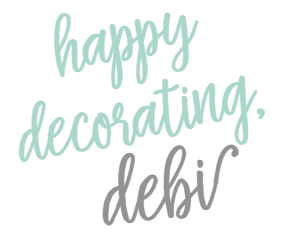 Believe me, if you are a decorator and in the Ozarks, you don’t want to miss this store! Don’t you just love the birds peeking from beneath the topiary! And there you have it! 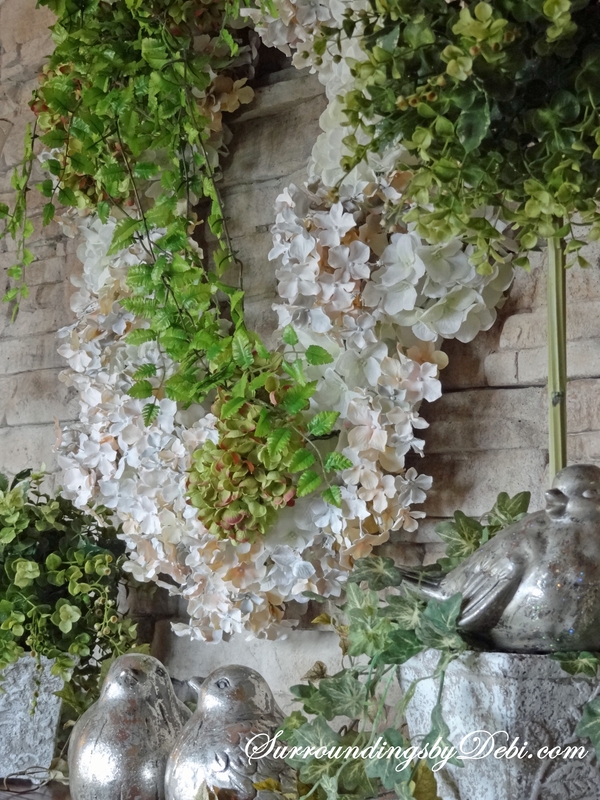 “Spring has sprung” in the house with this neutral spring mantel ~ now if Mother Nature keeps it up, my gardens will be in full bloom as well!!! I can’t wait to hear how you are bringing the spring season into your house! 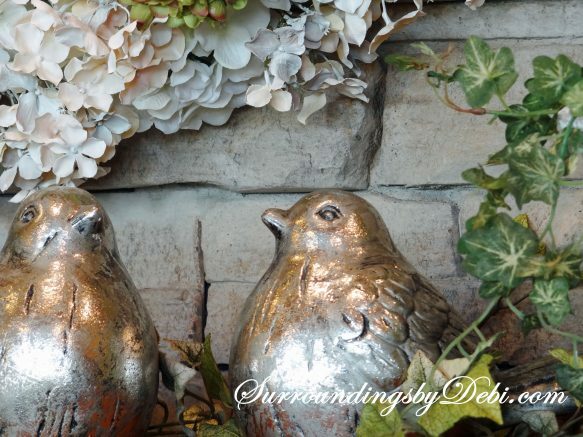 This is just gorgeous and the metallic birds are the icing on the cake! I love your style, so pretty!